In Florida, we have statutory traffic laws that govern how drivers are to make left turns on all public roadways. If a driver does not abide by these road rules, then the law dictates that a driver should be issued a ticket, or even fined. However, driving is also governed by Florida common law, which is created by our judicial system from previous court decisions. Therefore, any driver making a left turn who crashes into another vehicle may be held liable under Florida common law, or court-created negligence law, as well as statutory motor vehicle laws. Florida’s traffic statutes dovetail with common law to assist a car accident victim in recovering compensation for his or her injuries. The key for finding liability in these car accidents is to establish that the driver failed to meet his or her “duty of care” to oncoming traffic while making a left turn. See: Why Does It Matter If Someone Wasn’t Acting Reasonably At The Time Of A Car Accident? When determining a driver’s duty of care when a car accident occurs, one only needs to refer to Florida statutory law. What Does Florida Statute 316.151 Say About Making Turns? Interestingly, there are more regulations for left turns than right turns for both drivers of motor vehicles and for bicyclists. For example, when there is a left-turn crash, there is a specific Florida traffic law that applies to drivers making turns at intersections. What If There Is A Traffic Light? Under Florida Statute 316.151, if any governing authority (state, county, or local) installs a traffic control device at an intersection, then the driver must obey that traffic device. This is true even if that device directs the drivers to take a different course than what is provided in Florida Statute 316.151. To elaborate, Florida Statutes control how a driver is to turn at an intersection unless a traffic light (or other traffic device, like flashing lights at a construction zone) instructs otherwise. What About If You Are Riding A Bicycle On A Florida Street? Florida statutes also place requirements for anyone riding a bicycle on our roadways when turning left at an intersection. 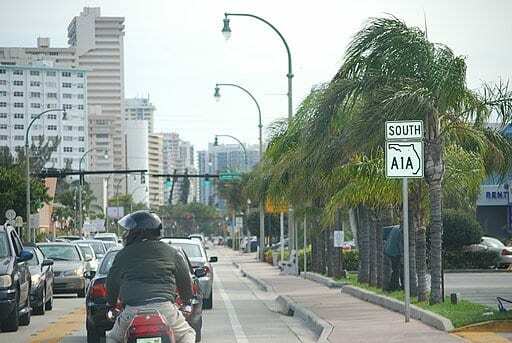 Bicyclists are instructed by Florida Statute 316.151 to follow the same rules as someone driving a motor vehicle, including following the directive of any traffic device. However, bicyclists have an option when taking a left turn at a Florida intersection. They can (1) approach the turn as close as practicable to the right curb or edge of the roadway; (2) cross the intersection keeping as close to the curb as they can; and then (3) before proceeding, make sure they obey any stop sign or traffic signal just like the cars and SUVs have to do. Note: It is not an excuse that the parties have not read our laws: drivers cannot get a Florida driver’s license without a basic knowledge of their rights and obligations, including yielding the right of way to oncoming traffic. Furthermore, all drivers must meet minimum standards of care defined by statute. When there is an accident at a street intersection here in Florida, the driver making the left turn may be held liable for the resulting accident damages if he or she is negligent as defined in the common law. Here, the left-turn driver must be shown to have (1) failed to meet the ordinary duty of care that a driver must use when operating the motor vehicle and (2) failed to exercise proper care in the left turn itself. What is “Duty of Care” When Making a Left Turn? When making the left turn, the driver needs to exercise more than the care used when driving down the street. A driver is expected to be extra-careful before making that left turn into a traffic lane where cars may be coming from the other direction. Here, the left-turn driver has a duty to (1) make sure that he or she knows the turn can be made in safety, (2) without danger to normal overtaking or oncoming traffic, and (3) without impeding the flow of traffic in either direction. If there is a crash, the accident will be analyzed from the perspective of the actions undertaken by the driver immediately before and during the left-hand turn and the crash. Facts will be gathered, including any photos and witness statements. Courts will also consider the distance and apparent speed of the approaching vehicle. Would the driver who is making the left turn, as a person of ordinary prudence, believe the approaching vehicle would reach the intersection at an appreciable interval of time after the motorist entered the intersection? If a person of ordinary prudence would believe that the two vehicles would reach the intersection at approximately the same time, the turning motorist must wait for the passage of the proceeding vehicle. If the driver does, then the driver violates the duty of care, and is therefore negligent. Autrey v. Swisher, 155 F.2d 18 (C.C.A. 5th Cir. 1946). After entering the intersection, the left turn must be made so as to leave the intersection in a lane lawfully available to traffic moving in such direction upon the roadway being entered. Whenever practicable, the left turn must be made in that portion of the intersection to the left of the center of the intersection. If the driver failed to do all of these three things, then he or she will be found to have failed in his or her duty of care in making the left turn. Under the doctrine of “last clear chance” the left-turn driver may escape liability if the other vehicle in the intersection has the ability to avoid the crash and fails to do so. If this vehicle could drive into the shoulder, or otherwise maneuver around a collision, then the left-turn driver may assert the common law doctrine and not be held liable for the accident damages. Several years ago, John Faherty and two buddies spent the day fishing in Flamingo, Florida, until about four o’clock that afternoon. After they were done, they got on road to drive home to Miami. It was a pleasant day, the weather was good. Mr. Faherty was driving north on Highway 1 in the far right-hand lane, driving at about 45 mph. The intersection of Highway 1 and S.W. 152nd Avenue was approaching. There was some traffic up ahead, but it was so far away that Mr. Faherty couldn’t tell the make of the vehicle. This part of the highway had a grassy median that separated the northbound lanes from the southbound lanes. Meanwhile, Allan Wittenberg was driving south on Highway 1 in the left-hand lane. He was driving a station wagon and he was hauling a 64 foot trailer behind it. Mr. Wittenberg turned on his left-turn signal as he approached the S.W. 152nd Avenue intersection. When he got to the intersection, he stopped. At a complete stop, he waited for the northbound traffic to pass so he could make his turn. When the nearest northbound traffic was about 500 feet away, Mr. Wittenberg decided he had time to complete his left turn. He hit the gas, and started driving across Highway 1. Mr. Faherty saw Wittenberg begin to move into the intersection from about a half a block away. Mr. Faherty tried to avoid the crash by slamming on his brakes, rather than swerve into the left-hand lane. He and his fishing buddies skidded straight ahead and collided with Mr. Wittenberg’s vehicle in the right-hand lane, as the Wittenberg station wagon and the first two-thirds of the trailer had cleared the highway. Of course, there was an accident claim made by Mr. Faherty which was denied and resulted in a court case. Settlement negotiations failed and the case went to the jury. The jury did not find the left-hand turn to be a violation of the driver’s duty of care. So, Mr. Wittenberg was not found liable for negligence damages. Mr. Faherty appealed the case and lost. The appeals court said that the jury could have ruled that the plaintiff had the “last clear chance” to avoid the accident. Faherty v. Wittenberg, 203 So.2d 52 (Fla. 3d DCA 1967). If you have been seriously injured in a motor vehicle accident involving a left-turn at an intersection, then you may have a claim for damages against the driver who was making an unlawful turn. If the driver turned into the oncoming traffic path, then the driver may have failed in his or her legal duty of care, which constitutes negligence under Florida law. Left-turn car accident claims can be more complex than other kinds of traffic accident cases. In fact, some of these accidents may require an accident reconstruction specialist to testify about the conditions at the time of the collision, including speed, weather, road hazards, the position of the vehicles on the roadway, and more. A good piece of advice if you or a loved one are injured in a left-hand turn car accident is to speak with an experienced car accident lawyer to learn about some of the issues that can arise with these claims, including the type of evidence needed to prove a claim and knowing how most insurance companies respond to these car accident claims. Most car accident lawyers, like Alan Sackrin, will offer a free initial consultation (over the phone or in person, whichever you prefer) to answer your questions.